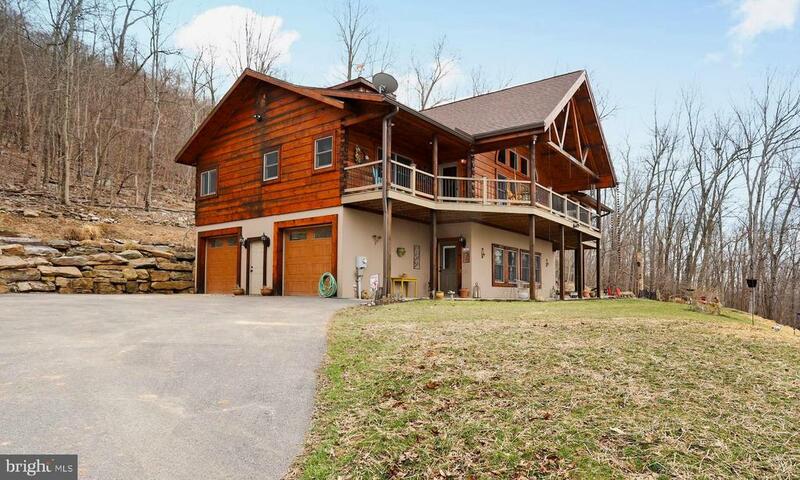 Comments: Absolutely beautiful & immaculate log home that sets on a private 15.18 acre lot. Pictures will tease you viewing the charming details the seller has added to this home. 4 levels offer different living. Main level has large Great Room that overlooks the mountains thru a wall of windows, Hickory floors, double sided gas fireplace with stone hearth. Open to the kitchen & dining area. Enter your dining area thru a Unique all wooden door from the patio for evening barbeques. Kitchen has a gas stove top & electric oven for the bakers. Beautiful Hickory Cabinets with granite counters. Coffee nook. Island & Pot hanger one of many details offered. Large laundry room with lots of storage. Master bedroom off of family room with great views. Master bath has heated floors, separate tiled shower and double vanities. You will love the claw tub for relaxing. 2nd bedroom is on other side of home which opens also to the deck with hot tub. 2nd bathroom around the corner also with heated floors, AWE! Upstairs is a loft for office or guest bedroom. Above that is our serene Widow Walk. Great place for yoga, painting or just watching the sunset. Lower level is finished with bedroom, bath, family room and game table or eating area. Utility room on LL for extra storage. Attached oversized 2 car garage. For you car lovers a detached 30x45 garage. Has it own septic for your RV parking. Electric & rough in for a bath. Seller installed an outside woodstove. Heats the home and water. Outside coe pond. Firepit to enjoy your evenings with family and friends. Come see this beautiful home. Only 6 minutes off of I-81. Close to Sleepy Creek for Fishing and boating.